The United Teachers of Los Angeles are on the precipice of a historic strike against corporate education reform. This year’s teachers strike has reached Los Angeles. Members of the United Teachers of Los Angeles (UTLA) recently voted to authorize a strike, with 98 percent of teachers voting in favor. The union says the Los Angeles United School District (LAUSD), under its new superintendent Austin Beutner, is pushing a charterization, privatization, and austerity agenda. UTLA, meanwhile, is part of a growing national union movement centered on “bargaining for the common good,” with demands and proposals that have come from months of working with community organizations, students, and parents. Alex Caputo-Pearl worked as a teacher for twenty-two years in the Compton and Los Angeles school districts before being elected UTLA president in 2014. He recently spoke with Suzi Weissman for her podcast on Jacobin Radio, which you can listen and subscribe to here. 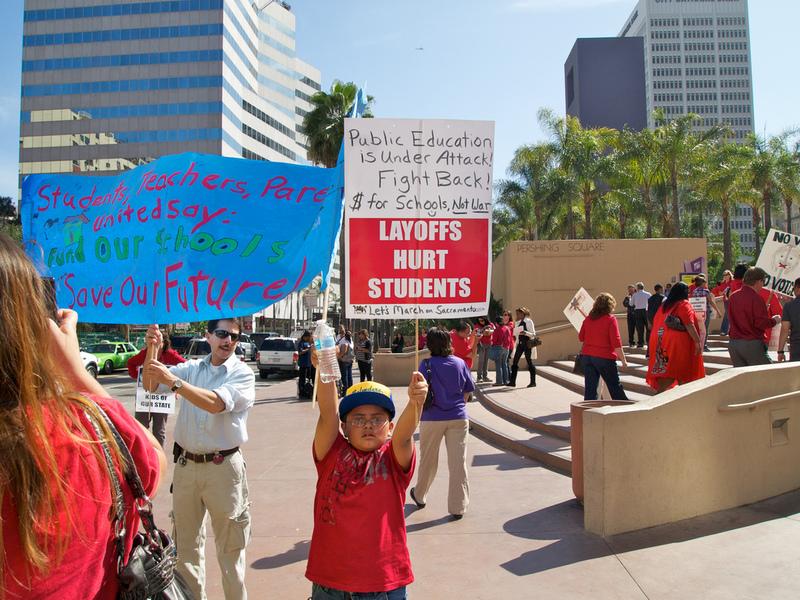 What are the UTLA’s and the LAUSD’s respective visions for Los Angeles schools? This is a struggle over our vision to reinvest in the civic institution of public education, and Austin Beutner’s and the privatizers’ perspective, which is to downsize the public school district and continue to accelerate privatization. Our strike authorization vote had historic numbers — not only in the 98 percent “yes” votes, but also in the 83 percent turnout among thirty-five thousand members across nine hundred schools (at a time where you sometimes have 10 percent of people voting in city council elections). We have proposals that fall into three categories. One category is economic demands. The district can more than afford them: it has a record-breaking reserve this year of $1.86 billion. The state requires that 1 percent of the district’s budget be put into a reserve; the district has 26 percent of its money in reserve. The school district serves over 90 percent students of color and over 85 percent low-income students — our students need the money now. Our economic proposals include things like reducing class size, getting more nurses, counselors, and school psychologists into our schools; and a fair wage for educators, since, as we head into a teacher shortage nationally, we’re going to need to be able to recruit and retain educators in some of the most difficult places to teach. The second category is non-economic — things that the district could do that would either actually save the district money or wouldn’t cost anything. One is cutting back on standardized testing. We have state and federal mandated tests, which are fine. We know that we have to do those. But there are also eighteen other discretionary tests that LAUSD makes teachers use. You could have an LAUSD student who, from transitional kindergarten to sixth grade, faces over one hundred standardized tests over the course of those eight years. This is an incursion on instructional time, and it de-professionalizes teaching. We’re calling for teachers to have discretion over what standardized tests are used in their classrooms. The second non-economic proposal is regulation of charter schools. Charters have grown 287 percent over the last 10 years. This drains about $600 million per year out of public district neighborhood schools. We believe in what the original intent of the 1992 charter law was, which was to have small experiments of charter schools serving high needs populations and then feeding lessons back into the public system, but that’s not what the charter school movement is now. It’s a vehicle for billionaires to privatize the system and undermine the public district. The third non-economic proposal would increase parent and educator voice in how money that is at the discretion of the school site is spent. So if a school believes that they need more money invested into parent engagement or more time for counselors, we want parents and educators to have more voice there. The third category is common-good proposals. Not only did we do massive member surveys to figure out what we wanted to bargain about for members, we also did community surveys and meetings with parents, students, and community organizations. We believe that the moment of a large public sector union contract negotiation should be used as a moment to also address the needs of the people that we serve, which are students and parents and families. So we have also brought to the table, for example, the idea that there should be more green space at our schools. That’s not something that mandatorily must be bargained in our contract, but the district and we could agree that we will bargain over it, to make sure that we don’t just have slabs of concrete at our schools but green space (which has been proven by research to decrease anxiety among students and help with brain development, the more kids are outside in pleasant environments). We’ve also got proposals around stopping racially discriminatory “random” searches of students and proposals on using unused district land to build affordable housing. There’s two pieces to this. One is the latest district offer from the district superintendent Austin Beutner (who has no education experience and comes out of investment banking). The latest is for a pay increase that is tied to several conditions including teachers having to work more. They actually want to combine that with raising class sizes. We’ve already got some of the largest class sizes in California and the nation. But he is also proposing nine different ways that the district could raise class sizes even higher. And no proposals that respond to charter regulation, staffing like nurses and counselors, any of the other items that I mentioned. The other big piece that is driving much of where the district is coming from is this leaked plan. Beutner likes to do a lot of things in the shadows, so he’s got a little shadow government of high-priced consultants that are not accountable to the public. They’ve put together this plan called “portfolio districts,” which is what they’ve done in Detroit, New Orleans, Newark — the places that have had their public school districts broken down. What it would mean in LA, according to Beutner’s leaked plan, is thirty-two networks of schools that are essentially managed by different groups. You might have a charter management company over one network of schools and a different private entity over another network of schools. It’s a classic privatization strategy. It would decrease the ability to actually regulate labor standards, working conditions, learning conditions, civil rights, and equity for students. Where are you in the bargaining and negotiating process? We’re in the fact-finding stage. We expect that we will have a fact-finding report from a panel that includes one person that the union appoints, one person that the district appoints, and a third person from the state Public Employee Relations Board. That panel will give a report, an assessment of the situation, perhaps some recommendations in the first couple of weeks of December. At that point, we can use that report as a basis to try to reach an agreement. Or, if that’s not viable, the district could impose its last offer. If it’s not viable to use that, to move to an agreement, we could legally strike at that point. How is the union organizing for the strike and how are you building community support? We’re pursuing an agreement and are going to continue bargaining. We’ve got a very broad bargaining team that includes classroom educators, nurses, counselors. We’ve had parents and community organizations at the bargaining table. We’re going to continue to try to reach an agreement. This really is the most crystallized version right now of the struggle between reinvestment, which we’re calling for, and downsizing and privatizing, which is what the district is calling for. Given that, we know we need the real capacity to strike if we have to. We’ve obviously taken a strike authorization vote with historic turnout and a historic “yes” vote. We have contract action teams that are built at all of our schools, so there’s more members involved now than we’ve ever had before, talking to their co-workers, getting information out, getting feedback back to us. We’re doing a series of escalating actions, which our members and parents and community are involved in, that includes a December 15 march in downtown LA. And that will be a sort of final throwing down of the gauntlet, that if we don’t have an agreement by January, then we could be facing a strike in January. So we’re doing escalating actions in that kind of school set organizing. In terms of the parent and community building, we work with a broad coalition called Reclaim our Schools LA, which involves faith-based, civil rights groups, and community groups, and they’re canvassing in neighborhoods, door-knocking, building parent support lists, having small group meetings with parents. This is a very comprehensive campaign. We’ve just been overwhelmed with the amount of positive support from parents and community. Because at the end of the day, parents want a public school district in their city. Parents care about class size, whether they’ve got a nurse or a counselor at their school, whether they have a voice at their school. These are all things we’re fighting for. Can you talk a bit more about what the austerity that the district has carried out has looked like, and how that relates to the ballot initiative that will be voted on in 2020? We’re all very acutely aware that districts in the state of California do have financial challenges. And there’s two main reasons for that. One is the California sits at forty-third out of fifty among the states for per-pupil funding — which, when you consider that California is the richest state in the country and the birthplace of Google and Silicon Valley and Hollywood and so on, is really criminal. That has to be addressed. The other thing that really hits districts, particularly urban districts, is very permissive state charter school law. Again, we think the original intent of charters was right on, with small experiments serving high needs students and feeding lessons back into the system. But when it has been taken over as a vehicle by billionaires to privatize the system, not serve all students, not serve special education students equally, not serve English language learner students equally, not serve the chronically truant students equally, then you’re just setting yourself up for a two-tier system with charters draining $600 million per year out of the LAUSD. We can’t have that. We’ve got to have two prongs in this fight. One is to get the district to spend some of its reserve. But simultaneously, we’re building a statewide campaign called “20 by 20,” which is the idea of getting to $20,000 per student and per pupil funding by the year 2020. We’re a part of a broad statewide coalition that just qualified for the ballot, the Schools and Communities First ballot initiative that will be on the ballot in November 2020, which will finally, after forty years, reform Prop 13 — not affecting homeowners, but affecting the wealthiest commercial property owners who have been jumping through a loophole for forty years. If we just tax them equitably, it will bring an additional $11 billion into the system for public schools and social services. We’re also a part of efforts to close the carried interest loophole, which doesn’t tax part of the income of hedge fund managers — a lot of whom live and do business in California. That’s another billion dollars. You want to shake loose some of the district’s reserve funds. Is that going to mean taking control of the school board? How do you force them to give up the reserve? The school board last year was bought by billionaires and the charter industry. Thirteen million was spent on the LAUSD school board races, more than has ever been spent on a school board race in the history of the United States. The first thing they did with their new majority was hire an investment banker with experience in downsizing but no experience in education. It’s why we are where we are, having to potentially go on strike to get the district to spend the reserve rather than hoard it and using it as a pretext to make cuts, consolidations and downsizing. Everything comes back to organizing and people power. So since 2015, we’ve been a part of building a group called the California Alliance of Community Schools, which includes ten of the largest local unions in California. We’re organizing towards more state funding and sharing how we organize more power among parents and community, and our vision for what we want our schools to look like: a community schools model which includes more wraparound services, more parent engagement, a broader curriculum, more arts and music. So we’re coming to a crisis point here in California. The Oakland teachers union is also in fact finding now and may have to strike. The question is, are we going to starve our public school districts, from LA to Oakland and beyond, or are we going to actually invest in public education? How much would you say that you and the union have been inspired by the red-state teachers rebellion, and how connected to these movements are you? Alex Caputo-Pearl is president of the United Teachers of Los Angeles.